Fantastic new CD from the old master of Blues harmonica Mr. James 'Superharp' Cotton! Cotton co-wrote seven of the tracks with Tom Hambridge (Buddy Guy, Joe Louis Walker, Susan Tedeschi) making this album the most personal CD he ever produced. SEYDEL says thank you for this awesome CD-cover picture! Humble, yet powerful! Few players have transformed the humble blues harmonica by creating a unique and powerful sound quite like James Cotton has. With a career spanning more than 66 years, beginning with his road travels at the age of nine with Sonny Boy Williamson (II), James Cotton is one of the true masters of the blues harmonica. He’s back again, this time on the cover of Living Blues magazine. The story takes you back to where he started as a young orphan and walks you through blues history to the present day, foretelling the release of Cotton’s upcoming album, Cotton Mouth Man. James Cotton knows about perseverance, hard times, and the true soul of the blues. He faced adversity with conviction and forged a path for the blues. Cotton defines the heart and soul of the blues and inspires us to carry on and do the same. The harmonica he holds is more than a simple instrument; it is an element of trust. 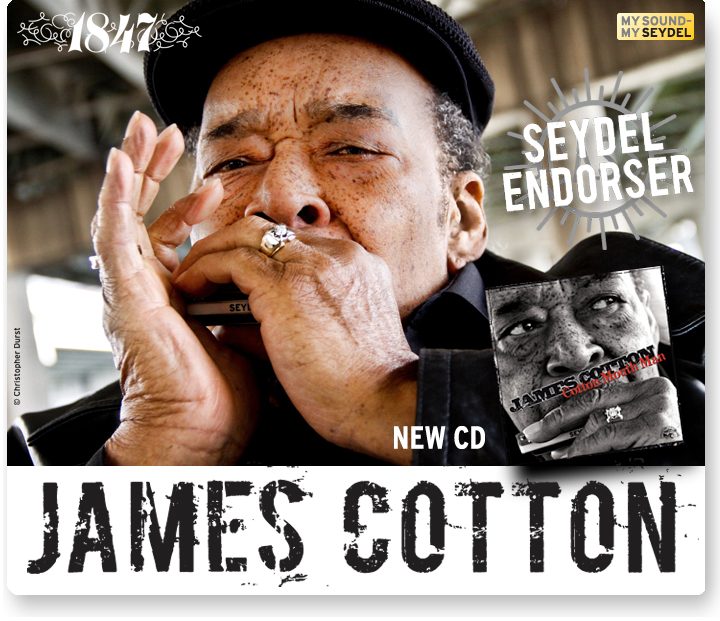 James Cotton trusts the Seydel 1847 to translate the inner beauty, vulnerability, and power of his soul to the masses. His trust has been earned by master harmonica makers in Klingenthal, Germany at the world’s oldest harmonica factory, Seydel. Standing alone as the one company whose only business is harmonicas, Seydel’s focus and dedication to the advancement of the harmonica are what James Cotton looks for when he’s ready to pronounce the blues. Today, we join the blues community in paying homage to James Cotton, who teaches us that the blues is more than a musical genre; it is an institution. Read the story on James Cotton in Living Blues for a glimpse into a life shaped by the blues and one that shaped the blues in return. The true masters, the pioneers, the players such as James Cotton, Charlie Musselwhite, Lazy Lester, Mark Hummel, and many others who have sampled every harp available have settled on the one that provides everything they need to share that soul, to push the emotions of an audience to the edges of seats, to invoke the presence of past and future masters - the SEYDEL 1847. Special thanks to James Cotton and the others who have inspired us, given us the desire to move ahead, who have stood at the crossroads and shown us that whatever path we choose can be as successful as we make it to be.